Thanks for shopping at the WellPetUSA Store. All items in this store are donated. Some items are hand-made and one-of-a-kind. New items are donated each month so be sure to visit often. During the months of January, February and March, all proceeds from our store will benefit The Meow Bow Wow Fund -- the fund used for spaying and neutering! Are you an Artist? Are an artist or the crafty-type? Would you like to learn more about donating your product to the WellPetUSA store? Email our pet store professionals at petstore@wellpetusa.org for more information. Just a Rhinestone Cat pin. Tan, white and faux-Amber multi-bead necklace with matching earrings. Necklace is long; earrings are evening length. Sparkle red and yellow glass beads with faux-gold findings. Necklace is slightly longer than choker length. Bracelet is medium fit. Fluorite and sterling silver bracelet with silver clasp. Blue and white glass bead bracelet with earrings. Glitter Cat Pin with silver or faux-gold whiskers. Faux-silver Kitten in Treat Jar pin. Faux-silver Cat Sitting in Window pin. Faux-silver Cat Sleeping in Chair pin. Multi-color bead memory bracelet. One size fits most all. (Does not include beanie baby). Faux-Amber stretch bracelets (2). One size fits most all. Faux-Amber glass memory bracelet. Larger size. Fluorite and Australian crystal bracelet with silver clasp. Necklace and earrings with dark colored stones. Great faux crystals and faux sterling beads presented in a delightfully light-weight necklace and earrings set. Necklace is slightly longer than choker length; earrings are small drop and pierced. Great gift for a friend or family member! This is a fabulous bag! It is a foldable, wheeling tote with telescoping support! Unfolded, the dimensions are 24 x 13.5 x 6 ¼ inches. Great for grocery or flea market shopping. It folds flat for easy storage (folded dimensions are 13.5 x 8 x 3 inches). Makes a great gift for dog lovers! Necklace and earrings with light colored stones. 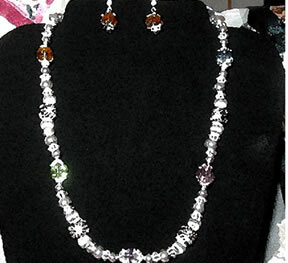 Great faux crystals and faux sterling beads presented in a delightfully light-weight necklace and earrings set. Necklace is slightly longer than choker length; earrings are small drop and pierced. Great gift for a friend or family member! Many Cats Scarf. This scarf will go with anything! A black background with gold, silver and bronze colored cats of all sizes and shapes. It's a shorter length and square in size. An elegant way to accessorize a tailored dress or pantsuit! 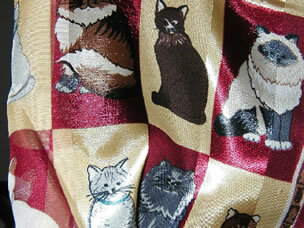 Red and Gold Scarf with Cats. This fun scarf will dress up just about any ensemble! The background is red and gold squares with a great looking cat in each square. Cats are all shapes and sizes and vary from gold, silver and bronze. It's an extra long length and about 8 inches wide.